The two most powerful men in Britain are godfathers to each other’s children and have been close since entering Parliament together in 2001. 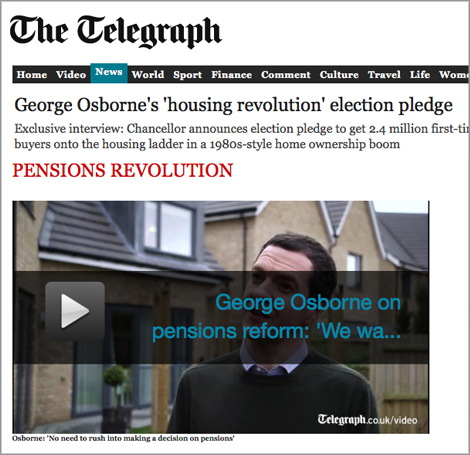 Mr Osborne argues that his bold new home ownership targets fit with the party’s record of radical reforms intended to put more people in charge of their own assets. This week, two million over-55s with a collective £140 billion of pension savings will get unprecedented new freedoms to access their money and spend it as they wish. Instead of being forced to buy annuities, which can offer poor value, they will be able to put the money towards other types of investment, such as buy-to-let homes. Mr Osborne urges savers to “go and explore this new world” of control over their money on what has been labelled “pension freedom day” on Monday.